dRadiology (B.M, E.Q., M.G. ), University of Calgary, Calgary Alberta, Canada. BACKGROUND AND PURPOSE: The importance of time in acute stroke is well-established. Using the Interventional Management of Stroke III trial data, we explored the effect of multimodal imaging (CT perfusion and/or CT angiography) versus noncontrast CT alone on time to treatment and outcomes. MATERIALS AND METHODS: We examined 3 groups: 1) subjects with baseline CTP and CTA (CTP+CTA), 2) subjects with baseline CTA without CTP (CTA), and 3) subjects with noncontrast head CT alone. The demographics, treatment time intervals, and clinical outcomes in these groups were studied. RESULTS: Of 656 subjects enrolled in the Interventional Management of Stroke III trial, 90 (13.7%) received CTP and CTA, 216 (32.9%) received CTA (without CTP), and 342 (52.1%) received NCCT alone. Median times for the CTP+CTA, CTA, and NCCT groups were as follows: stroke onset to IV tPA (120.5 versus 117.5 versus 120 minutes; P = .5762), IV tPA to groin puncture (77.5 versus 81 versus 91 minutes; P = .0043), groin puncture to endovascular therapy start (30 versus 38 versus 44 minutes; P = .0001), and endovascular therapy start to end (63 versus 46 versus 74 minutes; P < .0001). Compared with NCCT, the CTA group had better outcomes in the endovascular arm (OR, 2.12; 95% CI, 1.36–3.31; adjusted for age, NIHSS score, and time from onset to IV tPA). The CTP+CTA group did not have better outcomes compared with the NCCT group. CONCLUSIONS: Use of CTA with or without CTP did not delay IV tPA or endovascular therapy compared with NCCT in the Interventional Management of Stroke III trial. The importance of time is well-established in acute ischemic stroke. Ample evidence suggests that the benefit of treatment decreases with increasing time to treatment in intravenous and endovascular therapy (EVT).1⇓–3 It is critical to minimize time delays in stroke treatment workflow components, including imaging time delays. However, imaging protocols vary by institution, and there is no nationally or internationally recognized standard imaging protocol for evaluating patients with acute stroke. Multimodal imaging, including CT angiography, CT perfusion, or MR angiography and MR perfusion may provide useful information on arterial occlusion, collateral flow, and tissue viability. On the contrary, these imaging techniques may also delay initiation of revascularization therapies. Recent endovascular stroke trials (Multicenter Randomized CLinical trial of Endovascular treatment for Acute ischemic stroke in the Netherlands [MR CLEAN],4 Endovascular Treatment for Small Core and Proximal Occlusion Ischemic Stroke [ESCAPE],5 Extending the Time for Thrombolysis in Emergency Neurological Deficits–Intra-Arterial [EXTEND-IA],6 Solitaire With the Intention For Thrombectomy as Primary Endovascular Treatment [SWIFT PRIME],7 Endovascular Revascularization With Solitaire Device Versus Best Medical Therapy in Anterior Circulation Stroke Within 8 Hours [REVASCAT],8 Assess the Penumbra System in the Treatment of Acute Stroke [THERAPY],9 and Trial and Cost Effectiveness Evaluation of Intra-arterial Thrombectomy in Acute Ischemic Stroke [THRACE]10) demonstrating the benefit of endovascular therapy have used supplementary imaging, in addition to noncontrast CT, for patient selection. It is therefore imperative to understand whether additional imaging causes delays in the initiation of treatment of patients with acute ischemic stroke. The Interventional Management of Stroke III (IMS III) trial was a phase III randomized trial of endovascular treatment after intravenous tPA versus IV tPA alone.11 Multimodal imaging was available in a subgroup of patients at the discretion of the enrolling site. Our objective was to explore the effect of multimodal imaging: CTP+CTA or CTA (without CTP) versus NCCT on time to treatment and outcomes in the IMS III trial. A noncontrast head CT was the only required baseline imaging. Additional imaging, including CTP and/or CTA, was not a prerequisite for entry or patient selection in the IMS III trial. However CTA or CTP was performed at a few study sites at their discretion. The analysis consisted of 3 subgroups based on baseline imaging: 1) subjects with baseline CTP and CTA (CTP+CTA), 2) subjects with CTA (without a concurrent CTP study), and 3) subjects without CTA or CTP (noncontrast head CT alone). The baseline demographics, time intervals, and outcomes in these 3 groups were studied. The following intervals were calculated for all subjects: 1) stroke onset to emergency department (ED) arrival, 2) ED arrival to start of imaging, and 3) start of imaging to IV tPA initiation. Additional time intervals were calculated for the endovascular treatment arm: 1) IV tPA initiation to groin puncture, 2) groin puncture to the start of EVT, and 3) the duration of EVT (for subjects who received endovascular treatment). Baseline imaging time was defined as the time of the first imaging performed. EVT initiation was defined as the start of intra-arterial tPA/balloon occlusion/thrombus aspiration or the first deployment of the device, depending on the type of endovascular therapy administered. Similarly, the EVT end time was defined as the time of the last deployment, time of last thrombus aspiration attempt, or time of the end of intra-arterial infusion. Because the time intervals described above did not follow a normal distribution, descriptive statistics are reported as median (interquartile range). Normality was assessed graphically via histogram and quantile-quantile plot. The Hodges-Lehmann estimator of location shift was used to calculate differences, with confidence intervals, in time intervals between groups. To compare the 3 groups (CTP+CTA versus CTA versus NCCT), we used the Kruskal-Wallis test for continuous variables and the χ2 test for categoric variables. The primary clinical outcome (mRS 0–2 at 90 days) was analyzed via a logistic regression model to estimate adjusted odds ratios. The linearity in the log assumption was confirmed for continuous covariates. All tests were conducted at the .05 level of significance. If there was a significant association, pair-wise comparison was also performed between the CTP+CTA and CTA groups. Because this analysis is exploratory, P values were not adjusted for multiple testing. Because the endovascular group was of particular interest in light of recent trial results, separate models were created to estimate odds ratios by treatment. Statistical analysis was performed in SAS, Version 9.3T (SAS Institute, Cary, North Carolina). Of 656 subjects enrolled in the IMS III trial, 90 (13.7%) received CTP and CTA, 216 (32.9%) received CTA (without CTP), and 342 (52.1%) did not receive CTP or CTA (NCCT). Eight subjects with CTP performed without CTA were excluded from the analysis to increase the homogeneity within groups. Demographic characteristics are provided in Table 1. The time intervals for the 3 imaging groups are provided in Table 2. The use of CTP or CTA imaging did not cause delays in IV tPA (Fig 1) or endovascular treatment (Fig 2). Time from the start of imaging to IV tPA initiation was shorter in the CTP+CTA and CTA groups, compared with NCCT (6 minutes [95% CI, 1–11 minutes] and 8 minutes [95% CI, 4–12 minutes] shorter, respectively). Door to IV tPA initiation was not significantly different among groups. Time from baseline imaging to puncture was shorter in the CTP+CTA and CTA groups compared with NCCT (17 minutes [95% CI, 4–29 minutes] and 22 minutes [95% CI, 14–30 minutes] shorter, respectively). Groin puncture to EVT start was faster in the CTP+CTA and CTA groups, compared with the NCCT group (12 minutes [95% CI, 7–18 minutes] and 7 minutes [95% CI, 2–12 minutes] faster, respectively). EVT duration was 26 minutes (95% CI 14–37) faster in the CTA compared with the NCCT group, though the CTP+CTA and NCCT groups were not significantly different. Total ED arrival to puncture time was shorter in the CTP+CTA and CTA groups compared with the NCCT group (14 minutes [95% CI, 0–27 minutes] and 17 minutes [95% CI, 8–26 minutes] shorter, respectively). 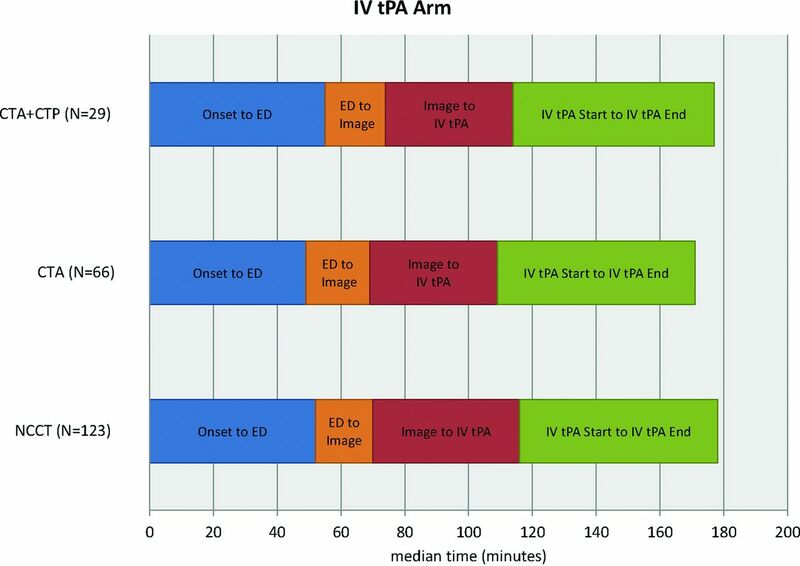 Time intervals of 3 imaging subgroups in the IV tPA treatment arm. 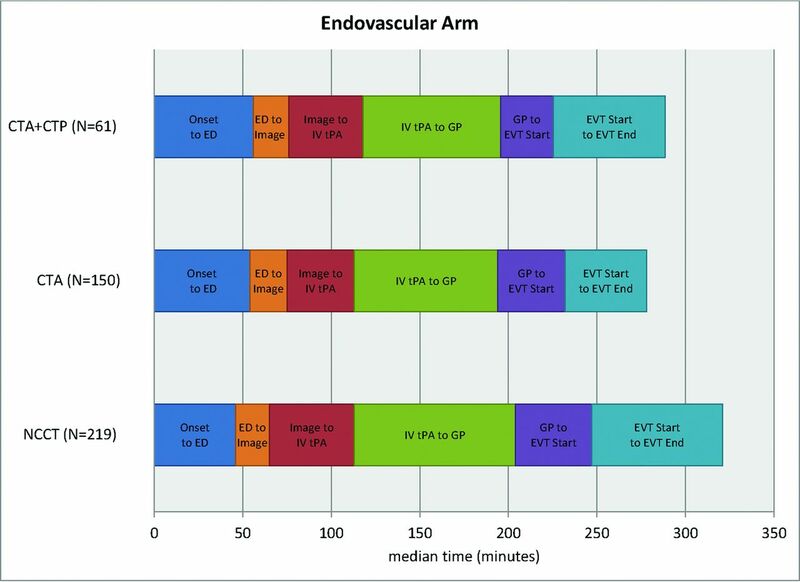 Time intervals of 3 imaging subgroups in the endovascular treatment arm. There were no significant pair-wise time interval differences between the CTP +CTA and CTA groups. The rate of mother ship enrollment (direct admit of patient to tertiary stroke center) differed by subgroup: 97% in CTP+CTA group, 94% in CTA group, and 77% in NCCT group. When transfer subjects were removed, no statistical difference remained among groups for the time from onset to IV tPA bolus (P = .5568). Times from imaging to groin puncture and groin puncture to the start of EVT were still shorter in the CTP+CTA and CTA populations (P = .0088 and P = .0006, respectively). The high-enrolling sites (defined as sites that enrolled >6 subjects) were identified because these are usually high-volume, experienced stroke centers and tend to have established systems of care with streamlined workflows. There was no difference in the proportion of subjects from high-enrolling sites by imaging subgroups (85% CTP+CTA, 88% CTA, 86% NCCT; χ2, P = .7947). The sites were grouped by the ability to perform CTP, defined as having at least 1 subject in the CTP+CTA group, and we compared time to treatment and outcome. There were no significant differences between CTP sites and non-CTP sites in time from ED to IV tPA initiation, time from ED to groin puncture, or 90-day mRS of 0–2 (Table 3). In the IV tPA treatment arm, there was not a significant difference in good clinical outcome in the 3 imaging subgroups (34.5% in CTP+CTA versus 40.9% in CTA versus 38.2% in NCCT; P = .8338). In the endovascular arm, more good outcomes were observed with CTA (39.3% in CTP+CTA versus 52.0% in CTA versus 33.8% in NCCT; P = .0022). In the endovascular arm, subjects with CTA had about twice the odds of good clinical outcome compared with subjects with NCCT, after adjustment for age, NIHSS strata, and time from onset to IV tPA initiation (adjusted OR, 2.12; 95% CI, 1.36–3.31; Table 4). The principal finding of our study is that additional imaging, including CT angiography with or without CT perfusion, did not delay treatment times compared with noncontrast CT in the IMS III trial. In fact, the imaging algorithms of NCCT + CTP + CTA or NCCT + CTA are possible with faster treatment times than NCCT alone. The guiding principle of stroke therapy is rapid treatment because potential benefits and less adverse events are greatest with earlier reperfusion. Recently, multiple acute stroke trials have demonstrated that endovascular therapy improves functional outcomes in subjects with major arterial occlusions compared with standard therapy, including IV tPA.4⇓⇓⇓⇓⇓–10 These trials included CTA and/or CTP imaging techniques to identify patients who would be likely to benefit from endovascular therapy. The MR CLEAN and REVASCAT trials used CTA to identify proximal vessel occlusion; ESCAPE evaluated vessel occlusion and collateral circulation by using multiphase CTA; EXTEND-IA used CTA and CTP with automated perfusion processing; and the SWIFT PRIME study started with CTA/CTP or MRA/MR perfusion but amended the imaging protocol to a CT/CTA/MRA strategy to accommodate more sites. Multimodal imaging selection in these trials may lead to a paradigm shift in the use of imaging in acute ischemic stroke work-up. Investigation of workflow while using these imaging algorithms is even more important in the current era. The strength of our study is that we have analyzed time to treatment with 3 different imaging paradigms in the setting of a large, randomized multicenter acute stroke trial (IMS III). The recent endovascular stroke trials selected patients on the basis of additional imaging, including CTA, multiphase CTA, or CTP. These trials do not have a control NCCT-alone group for similar workflow comparisons, as we have in our study. Our results support the findings of these trials by suggesting benefits with the use of CTA with or without CTP in the work-up of patients with ischemic stroke. We found that the CTA group of subjects was associated with better clinical outcome in the endovascular arm, likely a marker of faster treatment times among more advanced stroke centers. In a previous analysis by using data from the IMS III trial, we found that the odds of favorable outcome in subjects with baseline CTA were higher.12,13 In this study, we have further explored this group by adding CTP to the imaging analysis. In a prior study involving a multicenter, prospective, single-arm thrombectomy trial, our group demonstrated that multimodal CT-based imaging did not affect workflow.3 Our results are consistent with a single-center experience in which change in acute stroke imaging protocol to include multimodal CT did not delay administration of IV tPA.14 Our findings differed from those in a retrospective, multi-institutional study, in which advanced imaging was associated with delays in endovascular treatment without added benefit in outcomes.15 However, there are considerable differences between the 2 studies. The study by Sheth et al15 was a retrospective analysis of both CT and MR imaging, which included only subjects with endovascular treatment; perfusion imaging was used for decision-making, and the study did not address the vascular imaging times and time to IV tPA. Most surprising, in our study, the NCCT group had longer treatment times, including imaging to IV tPA initiation and imaging to endovascular treatment times. This may be multifactorial. A CTA study can be advantageous for endovascular therapy planning, adding valuable information regarding the presence or absence of large-vessel occlusion, the exact site of the occlusion, anatomic details of the vessels, and the presence of atherosclerotic plaque, and as a result, CTA can potentially reduce procedural time.13 In addition, institution-specific practice and workflow patterns may translate into faster treatments. Experienced, high-volume stroke centers may have parallel processes in place, whereby the treatment decisions are made in the CT console, including administration of IV tPA (if appropriate) after NCCT.16 A workflow that offers IV tPA administration in parallel to imaging and rapid activation of the interventional team has the potential to reduce treatment times. Perfusion may provide information regarding tissue viability. However, in our analysis the addition of CTP did not add an outcome benefit compared with CTA alone. Potential reasons for this observation include the following: 1) CTP was not always used for treatment decisions; 2) there is marked variability in CTP postprocessing, and its ability to reliably identify nonviable tissue likely varies substantially across centers; and 3) there is a high potential for selection bias, and patients who underwent additional CTP imaging may have had different baseline characteristics from those who did not. Our study has several important limitations, including the heterogeneity of imaging protocols in the IMS III centers. Our data did not address the institutional variables affecting workflow, which is critical in understanding the differences in time parameters. Institutional practice variability due not only to the large number of participating IMS III centers (58 centers) but also changes in practice during the trial (2006–2012) confound analysis of center-specific practice patterns. Institution-specific data on workflow details around IV tPA administration, neurointervention team activation, and time taken for study consent were not available. We also acknowledge that other unmeasured variables, including general-versus-local anesthesia and complete-versus-focused angiograms, can influence the time intervals. Although CTA and CTP can be performed quickly with the new-generation scanners (median time to perform CTP+CTA and CTA was 9 and 5 minutes, respectively, in our study), data postprocessing and interpretation and decision-making to activate endovascular teams can cause time delays, and we could not analyze this step of the workflow. Ideally, the image processing and interpretation should be performed in parallel with other workflow steps rather than being a sequential flow, to minimize delays. Another limitation of our study is that it is unclear whether CTA/CTP imaging was used for treatment decisions with potential impact on outcomes, particularly in the endovascular arm, though as per the study protocol, advanced imaging was not used for treatment decisions. We acknowledge that there are constraints in the data that particularly limit what can be said about the role and importance of CTP. The key ones are the relatively small number of patients who underwent CTP and the lack of information about how the CTP data were processed or used in the study. We did not analyze the MR imaging–based paradigms due to a very small number of subjects who underwent baseline MR imaging in IMS III. Although MR imaging has obvious diagnostic advantages, it can cause delays in treatment compared with CT-based paradigms.3,17,18 Finally, this is a post hoc analysis and additional confounding factors and baseline differences may account for the differences in outcome, thus limiting the generalizability of our results. The outcome differences should be viewed with caution and in the context of limitations of a post hoc analysis. Use of CTA with or without CTP did not delay IV tPA thrombolysis or endovascular therapy compared with NCCT in the IMS III trial. Efficient institutional protocols and expedited workflows to allow rapid neuroimaging for patient selection without delaying treatment are very relevant in the current landscape. Disclosures: Achala Vagal—RELATED: Grant: Clinical and Translational Science Awards 8 UL1 TR000077-05,* Genentech,* Comments: research grant: Clinical and Translational Science Awards KL2 Career Award; research grant: Imaging Core Lab, PRISMS trial, Genentech. Lydia D. Foster—RELATED: Grant: National Institute of Neurological Disorders and Stroke (IMS U01 NS077304). * Sharon D. Yeatts—RELATED: Grant: National Institutes of Health/National Institute of Neurological Disorders and Stroke (U01 NS052220),* Comments: Statistics and Data Coordination Center for IMS III: unblinded statistician; UNRELATED: Consultancy: Genentech, Comments: PRISMS Trial Steering Committee member. Andrew M. Demchuk—RELATED: Grant: National Institutes of Health/National Institute of Neurological Disorders and Stroke,* Comments: National Institutes of Health funded the Calgary CT Core Laboratory for the IMS-III trial; UNRELATED: Payment for Lectures (including service on Speakers Bureaus): Medtronic, Comments: honorarium for Continuing Medical Education lectures. Michael D. Hill—RELATED: Grant: National Institutes of Health/National Institute of Neurological Disorders and Stroke*; UNRELATED: Consultancy: Merck, Comments: paid Adjudication Committee for outcomes assessment in clinical trials; Grants/Grants Pending: Covidien,* Comments: grant for the ESCAPE trial; Stock/Stock Options: Calgary Scientific (stock ownership, imaging company). Thomas A. Tomsick—RELATED: Grant: National Institute of Neurological Disorders and Stroke,* Comments: Angiography Core Lab. Interventional Co-Principal Investigator; UNRELATED: Expert Testimony: Multiple legal entities. Mayank Goyal—RELATED: Grant: Covidien,* Comments: partial funding of ESCAPE trial through an unrestricted grant to University of Calgary; Consulting Fee or Honorarium: Covidien, Stryker, Comments: speaking engagement on acute stroke, design and conduct of SWIFT PRIME trial; Other: GE Healthcare, Comments: licensing agreement regarding further development of systems of stroke diagnosis. *Money paid to the institution. A.V. was funded by the Clinical and Translational Science Awards 8 UL1 TR000077-05 CT2 Award, the Imaging Core Lab, A Study of the Efficacy and Safety of Activase (Alteplase) in Patients With Mild Stroke (PRISMS) Trial, and Genentech. S.D.Y. was funded by the National Institutes of Health/National Institute of Neurological Disorders and Stroke (U01 NS052220). B.M. was funded by the Canadian Institute of Health Research, Heart and Stroke Foundation, and Alberta Innovates Health Solutions. Paper previously presented at: International Stroke Conference, February 10–13, 2015; Nashville, Tennessee.